Frank Lloyd Wright Buildings is part of the Tentative list of USA in order to qualify for inclusion in the World Heritage List. I have been to exhibitions at the Guggenheim Museum many times over the years, and a recent visit reminded me that Frank Lloyd Wright Buildings tentative site is up for consideration for inscription in 2019. The striking white spiral of the museum is practically unmissable for any New York visitor - even if you do not intend to see an art exhibition inside, you will most likely walk by the building along the Museum Mile, or at least ride by in a double-decker tourist bus. On some days during the most popular exhibitions there may be lines to enter the building, but if you manage to walk in, you can admire the interior entirely for free, since the museum ticket desk is located in the main rotunda on the ground floor - and you don't have to walk up the spiralling ramp to get a good appreciation of the structure. (Coincidentally, I happen to think that Guggenheim rarely delivers reasonable value-for-money when it comes to its changing exhibitions - being a corporate member with free access definitely helps me in this regard; for a short-time visit to the city, I would not recommend making Guggenheim one of your museum-going targets). I also visited Fallingwater in rural Pennsylvania several years ago. The house is just stunning in its design and in how it takes advantage of its natural setting. It is also colorfully furnished and appears very livable. You can only enter with a guided tour at predefined times, so plan well in advance. Only 15 minutes away from Fallingwater is another rural estate built by Wright, Kentuck Knob, markedly less impressive but still an interesting piece of design. It is not on the WH tentative submission, but if you are in the area, you may as well take time to see it. On this limited evidence, I would rate Wright Buildings higher than works of Horta or Le Corbusier, which are already inscribed. It seems very strange to me that many reviewers have been to the famous Solomon R. Guggenheim Museum in New York but did not write any review on this stunning piece of architecture, since I visited this museum last month on the special day that the museum was very quiet and almost empty by the change of the whole exhibition, allowing a big chance to admire its architecture detail with almost no restriction to take photo. Located on the famous Fifth Avenue next to the beautiful Central Park, the museum exterior was really stunning with unique design that some people said toilet-liked building, but for me, its pure white colour really reminded me a spinning top, a really contrast to its surrounding of luxury apartments. Inside, the famous spiral atrium was truly amazing, very futuristic and really beautiful piece of art by itself. The natural light in the atrium from the glass roof was quite a genius as not only bright the atrium hall, but also gave the feeling of warm and soft atmosphere to the whole place. I took an elevator to the top floor; the elevator itself was also quite unique with semi-circular or actually half oval shaped. From the top floor I walked on the ramp to the lower floor. Since there was no exhibition, I really questioned how the museum displays the art, especially painting with slope floor and little bend out wall. I continued to other exhibition halls and other small atrium. The small almost circle shaped atrium, while not grand like the main one, but still lovely to see for its nice design that plays with light. Another beautiful and stylish piece of architecture is the triangular shaped staircase, which was used as an alternative way to go up and down instead of the ramp of the main atrium. I also found out that the shape of toilet rooms are also in half oval shaped, a really nice design to use leftover space, but the unusual shaped also made toilet too big and load of unused space. I really enjoyed my time in the Solomon R. Guggenheim Museum, and really admired Frank Lloyd Wright’s creativity for his unique design in the atrium and staircase, maybe too futuristic but unbelievably provided the sense of softness and touchable in the same time. Too bad that this is just my second times to admire Frank Lloyd Wright’s works, another one is Hollyhock House in Los Angeles, and each site gave me the totally different experiences on this famous architect and made me a little bit confusing in his styles and overall idea. Anyway in my opinion I totally agreed that this nomination by USA to World Heritage Site programme is truly justified its place on the list. I will be among one of the many who will happily cheer when Frank Lloyd Wright's buildings get listed as World Heritage in 2016. I was able to visit two nominated sites in May 2015 - the Guggenheim Museum in New York, and Taliesin West in Arizona. 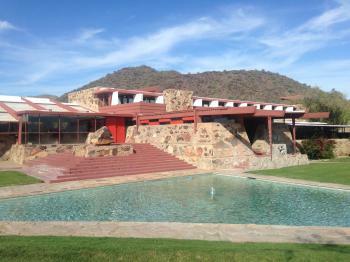 Taliesin West is indeed a masterpiece; a building that is alive and blends well with its environment. Wright's concept of organic architecture is beautifully manifested in the construction materials (stones with desert varnish). From the inside, the arrangement of windows and passageways naturally "frame" the desert landscape outside. The nearby hill is also enhanced by the house's slanted rooflines. Simply put: architecture as poetry! Why isn't the Bradley House in Kankakee Illinois (USA) included? 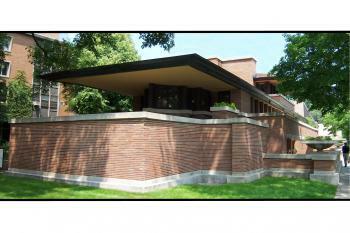 It is a beautiful Frank Lloyd Wright home that is often forgotten. While in High School I worked there as a hostess for the Yesteryear Restaurant. There is a stream flowing beneath the home and it displays beautiful architecture. Probably the United States greatest architect with a far-reaching influence and legacy of design that we encounter frequently in our own homes and communities. 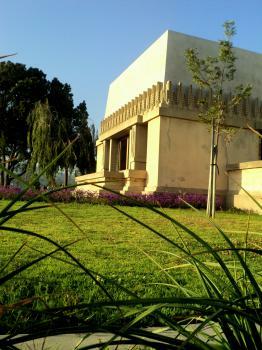 Hollyhock House is a real gem in Los Angeles. Barnsdale park is the location of this unique residence, indeed a central location in East Hollywood, this park has wonderful views of Griffith Park. Numerous events are held here including wine-tasting, film screenings in the lawn (front of house), and art exhibitions in the adjacent gallery. Taliesin West is just outside Scottsdale/Phoenix and the tour(s) require some consideration about what interests you most and the time you have. The property is large, the location is within a desert landscape. The building complex is expansive, eclectic, and often remarkable in its creativity as well as adaptation to the environment. The Herbert and Katherine Jacobs House remains private, and access to the property is restricted to the sidewalk. I would not recommend spending time and money to reach Madison only to see a bit of the exterior for 10 minutes. Your time would be better spent heading to Spring Green, Wisconsin to tour Taliesin or by heading south to Chicago, which is filled with Frank Lloyd Wright masterpieces. Which leads me to Unity Temple in Oak Park (worth exploring). Unity Temple just went through a considerable restoration effort, which I am curious to see. Through a self-guided tour, I was able to explore this early design by Wright which is well over 100 years old. I vividly remember the natural light which came from above despite a rather cold and drab afternoon. Lastly, the Guggenheim Museum in New York City, which can be paired well with exploring Central Park. Admission is quite expensive ($25). The exhibitions are certainly fun to explore as you circle Wright's rotunda design, which the museum curators use to great effect. I visited 5 of 8 sites included in this nomination. Frank Lloyd Wright was a pioneer of not just "American" architecture, but architecture in general. I have visited Fallingwater (my favorite piece of architecture) and it does not disappoint. I'm not going to waste my time trying to describe it to you... so i suggest you schedule a tour and JUST GO. You'll be glad you did. One thing that really sets Wright apart from the rest is that he was willing to create more than just a building (a mere shell) to live/work in. Rather, he created a living space that catered to whomever inhabited it. In fact, it seems as though his buildings "nurtured" their inhabitants. His organic architecture compliments our lives AND nature. He was a very, very forward-thinking man and was way beyond his time. I will be very surprised if these buildings do not make it onto the World Heritage List as they are exceptional testaments to one of the most important architects of the 20th century. A few years back I was lucky enough to have a week or so in Chicago and was able to tour the Architectural delights of the city. The buildings of Frank Lloyd Wright were certainly one of the highlights. The western suburb of Oak Park is littered with buildings he designed though only Unity Temple is nominated this is a great place to start getting an understanding of the architects’ work especially if you visit his house and studio. The effect of the Prairie school that he pioneered can be seen in houses across the wealthier outskirts of the city; however the finest building of his that I saw, the Robie House, is located in the less salubrious South side of Chicago. It is next to the leafy Chicago University campus (worth a visit for the excellent Oriental Institute Museum) and it is an exceptional feat of domestic architecture. The use of space and horizontal lines is incredible and I was surprised by how impressed I was by the building as I had not guessed it would be so good from the pictures I had seen. 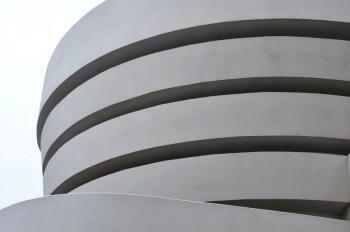 A few years later I was able to visit one of his most renowned works, the Guggenheim Museum in New York. This again was a highly impressive and unique building made all the better by the long stroll across Central Park that led to it. There are additions to the Museum to Wright’s original plans that make it look strangely like a toilet, however the aesthetic joy of the spiralling gallery is great both internally and externally. Though it has to be said it is not really that great a space for displaying works of art. I hope to continue viewing more of Wrights work as I travel around with Fallingwater and the Johnson Factory topping my wish-list. These buildings would be an excellent addition to the World Heritage List and it would also signify a slight shift in the focus of the US’s approach to it, hopefully for the better as there are so many modern architectural marvels that could be added in the future. I grew up across the street from the Darwin Martin House. When I was little it was wooded; an architect lived there. His daughter had her own skating rink. We played in the perglola. There were three buildings. At present it is almost completely restored. The feeling inside a Frank Lloyd Wright prairie house is both airy and warm - he really liked natural light. Windows through windows, skylighting - in 1904! The room they rebuilt in the Metropolitan Museum in NY has high ceilings but still feels roomy and very cosy at the same time. I wonder what it would be like to cook in a Frank Lloyd Wright kitchen. There are 10 buildings by Frank Lloyd Wright nominated for inclusion (as a serial nomination). One of these, arguably the most prominent one, is Fallingwater in Pennsylvania. I visited it on a bright sunny weekday in April. 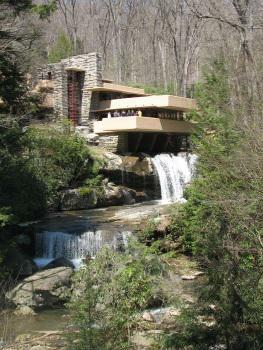 Fallingwater is located about half an hour from the highway, amidst forests and green hills. The scenery reminded me of Germany or Slovakia. There are many beautiful traditional wooden houses here. It is so remote that I am beginning to think that perhaps I will be the only visitor to tour the house. But when I approach the parking lot I find more than 40 cars already there! Now it becomes clear why you must book weeks in advance. As I'm an hour early for my tour, I first have something to eat at the café and have a look around at the museum shop. Both are well-stocked. With a group of about 15 people I then am allowed to visit the house. It is only visible when you come very near, you get there via a bridge. From the bridge there's already a great view of the characteristic terraces, like swimming pool diving boards. They are on one side supported by beams and the rest is suspended. Fallingwater was designed by Frank Lloyd Wright, and built between 1936 and 1938 as a country house for the Kaufmann family (for a price of 155,000 dollars). Its name comes from the waterfall in the Bear Run river which was incorporated in the design of the house. A guide gives us a tour of the interior. Materials used are walnut wood, reinforced concrete, natural stone slabs and steel. Also natural elements are reused, for example a large boulder. Almost all rooms have a fireplace, the central focus of the house. There are also sliding glass doors to terraces at different levels. It all looks very comfortable to live in. In addition to the home of the Kaufmann family, there is also a guesthouse. The guests were taken care of just as well as the owners. The family had five staff to serve and for the maintenance of buildings and terrain. My general conclusion about this site is that it's very much worth a detour when you're in Pennsylvania or Ohio. Also I think this would be a worthy addition to the WH List, so I'm looking forward to when the US finally gives this site a go. As Taliesin and Taliesin West: Bureau -deferred the examination of this nomination pending the results of a topic-by-topic study of contemporary architecture.